Background: Transforming growth factor beta (TGF-β) is a multifunctional protein that acts as a regulator of cellular function such as proliferation, migration, differentiation, apoptosis, vascular hemostasis, and development of organisms. As the TGF-β is the key player of cell proliferation and apoptosis it also involves in different diseases such as autoimmune disorder and vascular disease. 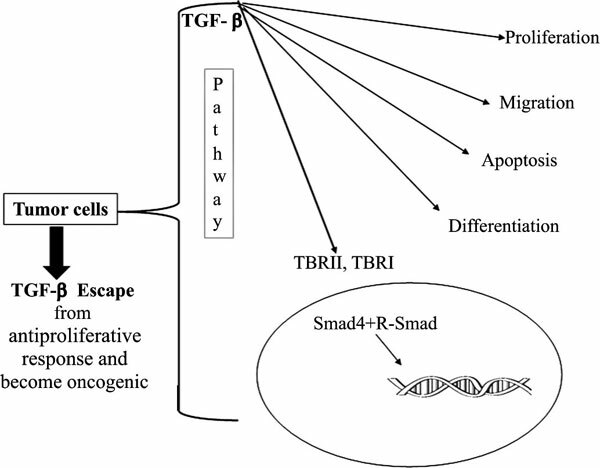 The TGF-β signaling pathway starts with the activation of TGFBRII and TGFBRI that trigger the phosphorylation of Smad cascade. The Smads complexes (Smad4+R-Smad) translocate to the nucleus and induce the transcription of the target gene. The dysregulation of the TGF-β signaling pathways has been reported in many human diseases including cancer. TGF-β acts as a tumor suppressor in the early stage of cancer but in late-stage show oncogenic factor and loss antiproliferative response. Objective: This reviews article determines the mechanism of TGF-β signaling pathways, the effect of TGF-β component on different cancers and provides a brief overview how it (TGF-β) acts as a tumor suppressor and promoter. Conclusion:TGF-β signaling pathways have a multifaceted and fundamental role in human development. It acts as a double-edged sword, both tumor suppressor, and tumor promoter. The tumor suppressor role is commonly designated as antiproliferative and apoptotic effects. TGF-β stops cell cycle at the G1 phase and promotes apoptosis. However, in advance stage of the tumor, it lost suppressor activities and begin tumor promotor due to the mutation in some component of the TGF-β pathway. Thus, The TGF-β can no longer control the cell cycle and proliferate the cancer cell. The increased production of TGF-β induces tumor invasion, motility, metastasis, immunosuppression epithelial-to-mesenchymal transition and angiogenesis. To study the exact molecular mechanism of TGF-β in the cancer cell and determine the oncogenic activities can provide successful and new therapeutic approach to reestablish the ordinary function of TGF-β. Transforming growth factor beta, apoptosis, hemostasis, cancers, nucleus, carcinogenesis.